Gan Ami Early Childhood believes children learn by doing. As children experiment with objects and handle materials, they make discoveries and learn new skills through play. When children leave our center, they are prepared to face challenges through communication, problem solving, risk taking, and exercising self-discipline. Our teachers carefully prepare the classroom with learning opportunities in different interest areas. We plan child and teacher-directed experiences in art, music, science, literacy, cooking, creative movement, verbal expression and cultural foundations. Balancing activities — free choice/structure and active/quiet — helps foster responsibility, self-regulation, and confidence. Our program is inspired by the approach of the schools of Reggio Emilia, where children are viewed as capable, parents are partners, and teachers are both guides and researchers. Teachers receive training on this approach and parents are invited to ask questions and provide support as classrooms engage in projects and long-term studies of ideas and concepts that are connected to the interests of the children. We are committed to developmentally appropriate practices as defined by the National Accreditation Commission for Early Care and Education Programs (NAC). 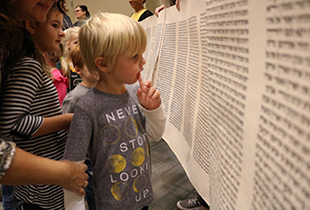 We integrate Jewish culture and traditions into each classroom — providing experiences for the celebration of Shabbat (the Sabbath) and festive Jewish holidays. We work in partnership with parents. Our center is open to family involvement and communication. We enjoy having families join us for lunch, snack, special days, and field trips. Parents are encouraged to share a hobby or interest with our children and an invitation always stands for you to read a book during story time or join us for Havdalah or Shabbat Sing. Contact Stacy Synold, Early Childhood Director, at 414-967-8201.